From Scafell Pike to Castle Crag the Wainwright Fells Map & Tick List (formerly the Lake District Hill Chart) shows the locations of all 214 Wainwright fells and includes a complete fell tick-list to record your peak bagging progress. A beautifully illustrated map of the Wainwright Fells. 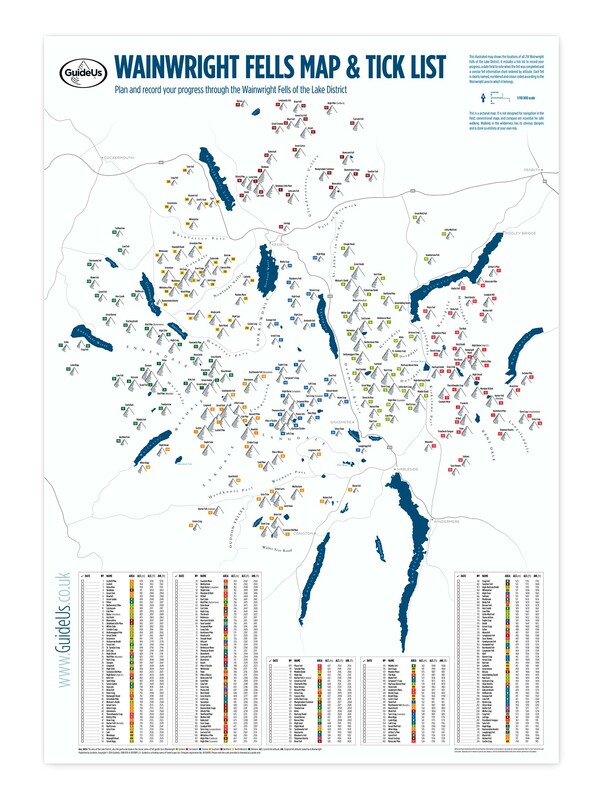 From Scafell Pike to Castle Crag the Lake District Hill Chart shows the locations of all 214 Wainwright fells and includes a complete fell tick-list to record your peak bagging progress. A simple, but effective chart that allows the user to easily identify and record those fells described in the Wainwright series of books as they are visited. Keeping it on display will give you the incentive to visit and re-visit as your 'collection' grows. A 'must-have' for Wainwright baggers; a fantastic guide for the casual visitor. The guide provides an easy to use, visual representation of all the Wainwrights making it easy to see at a glance what you've done and the peaks left to conquer! Fantastic - laminated it, put it on the wall and now starting to tick bits off as I bag them! Liked this a lot - we actually got it for our dog, who was just a year old. Its up on the wall and we are using it as a 'tick-list' as and when they are done. Only addition I would suggest is to add some subdued dotted lines to divide the map into the 7 Wainwright book areas. We find the map great for keeping a record of all our walks over the years. Chart is very good,its pinned on my wall in the extension, just got back from Keswick today having spent 5 days on the fells, I now have 48 fells ticked off. I look at it every day and it gives me an incentive to complete all of the fells on the list. I bought this as a present for my husband. We really like the layout and detail of information and immediately started using it. Also very good service from the company. The layout is very good for planning routes when walking a number of fells in one go. A much appreciated present for a London-dwelling lover of the Cumbrian hills. An invaluable aid to happy hours of plotting and planning how to complete that Wainwright list. A great inspiration; having it on the wall reminds me how many more of those hills I've got to drag myself up! A great product! 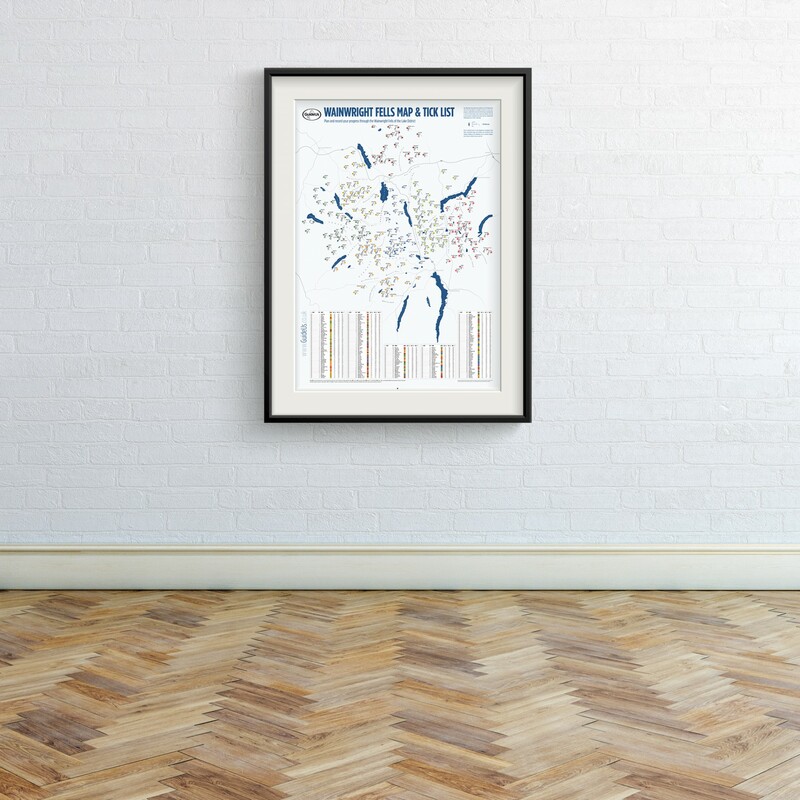 The chart is a perfect way to see how many Wainwrights I've got left to tick off, with extra details about their heights too. You can see which hills are grouped together - a great way to plan which part of the Lakes to head to for the weekend. Full marks! This chart does exactly what it says on the tin. It gives the walker the chance to tick off and / or colour-in the fells they have completed to date. Our chart already has the 64 Wainwrights highlighted, that we have conquered so far. As far as we know, there are no other products which allow you to specifically view the 214 Wainwright fells like this and be able to see the clusters and grouping of summits you still have to climb. Not even the Wainwright guides allow you to do this! A great aid for anyone wanting to do all the 'Wainwrights' It makes planning routes to bag the most peaks in one walk a lot easier. This map is great! My husband bought it for me when I decided I would try to complete all 214 Wainwright Hills in the Lake District. As this is a slow process, I use a different coloured pen for each year - i.e. hills climbed in 2008 are coloured in green, 2009 are coloured blue, 2010 coloured red etc. I recently passed the half way mark (currently 109) so I suspect my chart will be multi-coloured by the time I complete my challenge! The chart is also great for seeing which hills still need to be conquered, and where they fit in with surrounding hills, making route planning much easier. At the end of a day on the fells, one of the first things I do when I get home is to colour in the hills on the chart and the corresponding tick box too! A must for all A.W. footstep followers! A very useful and large reference guide, clearly labels the fells. A must for all A.W. footstep followers! I love this map it helps me plan which peaks to do collectively, it is also easy check how many wainwrights you have climbed, more important how many still to go !!!! I first saw this map in a pub in The Lakes and resolved to get one for my son. 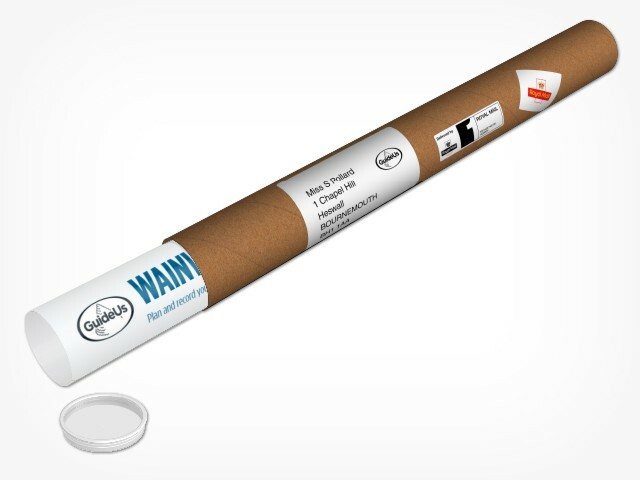 The map is of a large size and printed on high qulaity glossy paper. My son uses it to tick off and colour in his Wainwrights - he's on 45 and counting! I have really enjoyed this map because i have been able to literally tick off the fells I have walked. I would have liked the lakes and tarns to have to have been included too. I have found a large frame to display the map but of course each time you want to update your ticklist you have to take it out of the frame. This was purchased as a Christmas Present for my husband who is a keen walker and is particularly fond of the Lake District. He is enjoying being able to record his walking achievements. A very well received present. The Wainright Fells Tick List has pride of place on my bedroom wall. It's a very simple and effective way to show off and keep track of my Lake District exploits. It's a reminder of all the great walks that I've done (35) and is the motivation for the many that I've yet to do. I saw the hill chart in the ODG and thought I've got to have one, so I bought it. It came quickly and is now on the wall in our spare room. My map is framed in our hallway . we put gold stars on it when we complete each mountain. Our friends and family always look to see how we are going on. Now need to buy a couple more maps for friends. Never tire of looking at it - either brings back memories or motivates for the next trip. Great value. I bought the map for my Dad who has it up in his study. He was already at 160, which he ticked off on the map. It's a great way of planning the next trip and which fells to tackle next. Thoroughly recommend it. I love it. First saw it in old dungeon ghyll. Mines facing my toilet. I can sit for hours looking where I've been when I go! This is a great chart showing approx locations of each hill and having a tick list makes it a great motivational tool. My partner has put his on the bedroom wall which i admit i was dubious about at first but actually it looks great! This map made a great gift for my friend who's walked many times through the Lake District and is a huge fan of Wainwright and his walking guides. The map itself is made of sturdy, shiny stock, and we both love that he can mark off all the peaks he's summitted. Great attention to detail and makes a great piece of art for the dedicated walker. Ideal for planning your next walk! The Chart Map provides a comprehensive overview of the Wainwrights, allowing you to stand back and see how the different peaks fit together. Ideal for planning your next walk!